The Cowboy Action Shooters from TK4B makers of SliXPrings, SliX-Pins and SliX-Main provides a new innovation for protecting your pistols during travel, while at the match or when shipping. While traveling and participating at numerous matches during the past 14 years we have noticed quite a variety of pistol cases, and have bought and used many different styles ourselves. For us, none seemed to be convenient for our kind of travel and match participation. All were very cumbersome, stuffy single gun capacity or double cases that looked like briefcases. While most were sufficient for travel they didn’t fit in guncarts and were easy to confuse. After several iterations of trying to find a solution we arrived at what we call the SliX-Sok. The SliX-Sok is separated into two compartments to safely accommodate pistols of any design or style that has a barrel length of 7-1/2” or less. 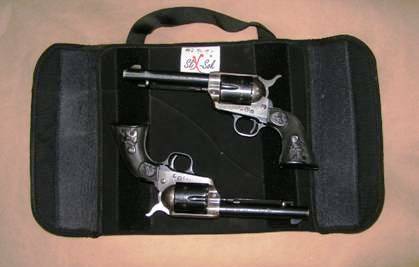 We have fit 1860 Colts, 1873 Colts, all models of Ruger’s, 1911 Wild Bunch autos, and have even crammed some 8” 1860 Colts, but because of the wide hook and loop closures, the flaps still closed and held them both securely. The SliX-Sok is made from Lamy Suede 2LB-1/8” Volara Tricot material bound with commercial grade nylon web binding and heavy T-70 nylon stitching for long lasting seams. The closing security is guaranteed by the 2” wide commercial hook & loop strips. Fully closed it measures 12-1/2” long, 10-3/4” tall and as wide is your grips plus 1/4”. It weighs just under 7 ounces empty and three SliX-Soks filled with firearms will nest in a USPS Large Flat-Rate box for mail shipping if you’re flying or crossing an international border. Incidentally, the latest FFL rules allow you to mail your handguns to yourself to a destination that will receive them and hold them for you. 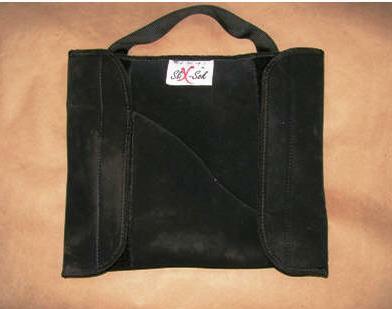 The 1” wide carry grip is made of flexible tubular nylon and is able to crush into any place the “Sok” will fit. After reviewing several styles of guncarts we discovered it will cram into small carts and easily slip into any medium or large cart for protection on or about the range. Additionally, the SliX-Sok will fit nicely into either the side pockets or inside the main section of your favorite standard range bag for participation in any other shooting disciplines where handgun space and room for accessories is needed. My personal SliX-Sok, after 4 months of testing through gravel dragging, concrete scraping, pickup bedliner abrasion, loading table dropping and general associated abuse.